I hope you all had a great day! 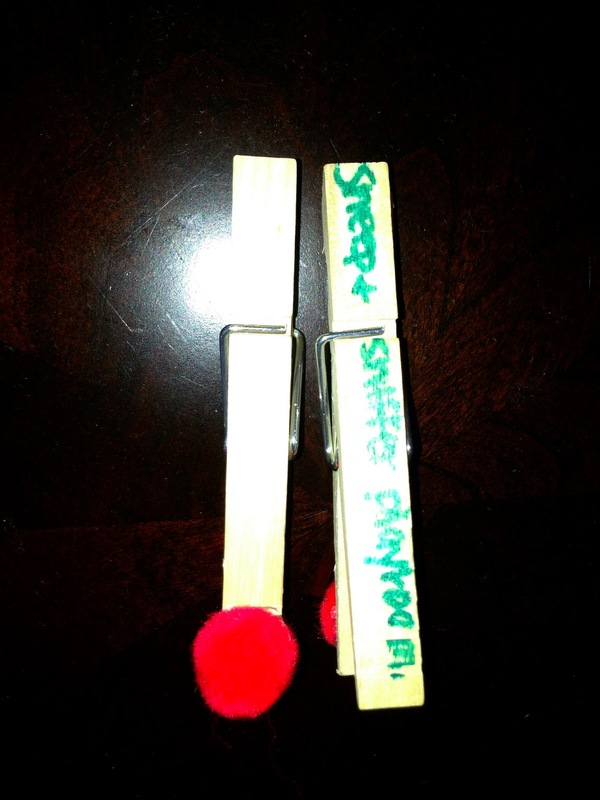 If you know me personally or even read my blog, you probably know that I am a mother to a sweet little boy and I take that job very very seriously. There are so many people that aren't able to have kids, so if you are able to you are extremely blessed. As a parent, God is giving us the job of teaching our kids right from wrong, how to shine like Jesus, and the meaning of responsibility. Children of today will be our future of tomorrow and if they arent raised correctly, that could be devasting. I can't control the future but as a parent, I try my best to give little Tony the necessary tools to succeed. 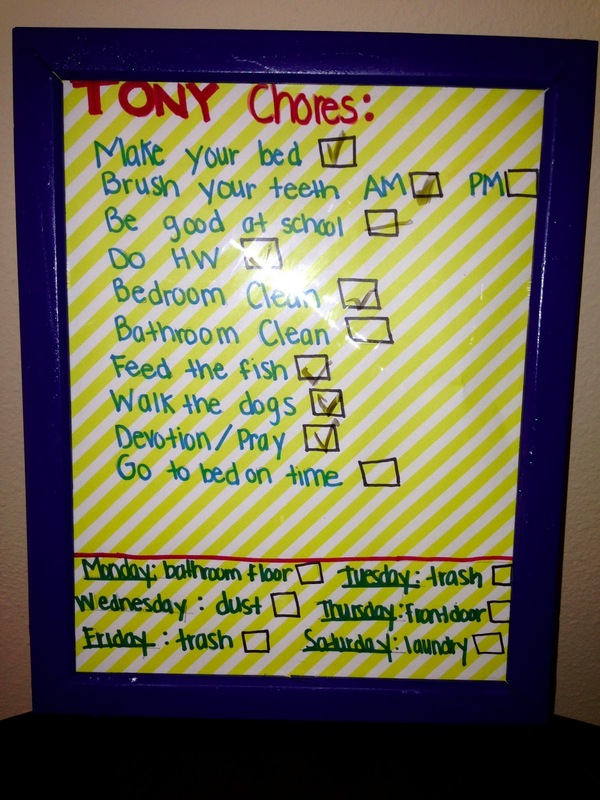 The picture above is little Tony's responsibility/chore system that I created for him. Tony and I feel that little Tony responds best to visual rewards, so I chose to use marbles for him, but you can use whatever works best for your child. The first step was making his chore list. I wanted to make his chore list something he could look at and check off as he did things. I took a piece of scrapbook paper from Michaels and wrote out all the chores he needs to do on top and on the bottom chores specific for each day. I then cut the paper to fit an old frame I had. I spray painted the frame blue so it can match his room decor. I put the paper in the frame and now it has become a dry erase board. He can use a dry erase marker to check off each thing he has done and then wipe it all off for the next day. Like I said before, we use marbles as our visual reward. 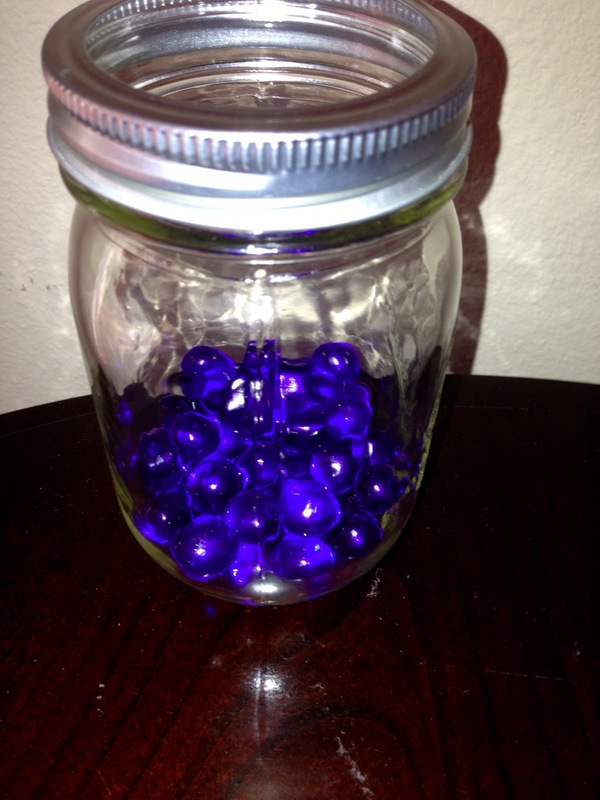 I just use a regular mason jar and blue marbles. He has the opportunity to earn three marbles each day, if he completes all his chores and has a good day at school. If he doesnt have a good day at school, he still has to do all his chores but he has to give me marbles out of his jar depending on what he did at school. Once he reaches the top, he has earned a new video game for his DS or his Wii. Not only does this make him work really hard to do good in school and keep up with his chores but he appreciates his new game so much more than if we just gave it to him for no reason. He also has the opportunity to earn extra marbles on the weekends by doing extra chores from the chore bucket. 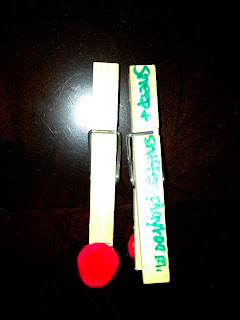 I took clothes pins (from the dollar store), glued some pom poms (from Michaels) on the ends, and wrote chores on the back of them. 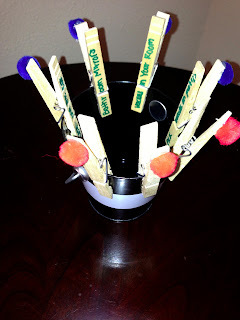 They are clipped onto this bucket I found at Target in the dollar bin section. Once he has a completed an extra chore he drops it in the bucket. I check what he has done and for every extra chore he's done, he receives an extra marble. The funny thing is he loves the system. He comes home excited to check things off of his list and he loves doing 'big boy chores.' He takes pride in his chores and is really excited when he has checked everything off at the end of the day. 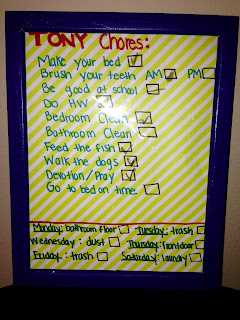 What kind of chore/responsibility system do use for your kids?